The following interview was by Aron Taylor of xcnation.com. Today we chat with Southlake Carroll HS, Carroll, TX junior Trevor Gilley. Gilley is a member of the 2011 NXN US#2 Southlake Carroll boys cross country team. His personal best in the 1600 meters 4:09.37 was run last spring at the UIL Texas State Track & Field Championships as a sophomore finishing 4th. Last Saturday Gilley won the Texas District 7-5A Championships 1600m in 4:12.50. Currently his Southlake team leads the xcnation.com Postal Nationals with a 5x3200m team average and US#17 all-time, 9:18.29. The Southlake boys team currently has eyes set on running the national record for the 4xmile at this summers New Balance Outdoor Nationals. Dedicated, Strong Willed, and Competitive- I feel these describe me best in a running sense of what has made me the runner I am. You have to be dedicated and stick with it or you just are not going to be good. I am strong willed to when I set a goal I will do anything to achieve it. I am very competitive with everything and while it could also be bad it is good in running because when it comes down to the end of the race I want to win no matter what and if you don't care about winning then you wont. Passion is the love for the sports to me. You have to like running to be a runner. You can't just do it and become good. I remember reading that Alan Webb was an influence on Robby Andrews going pro and when he asked Webb if he should go pro he asked him if he loved it. You have to love it to be fully committed and love the sport to be successful. A record breaker. My main goal is to break the state record in the 1600 for sure, but depending on how fast I run this year at state going for the sub 4 mark might become the ultimate goal. Set reachable but tough goals, stick with it even if you not the best right from the start, and don't ever get a big head and think you are better than you are. People who are good examples for the sport that show dedication and commitment to others. 6. What does team mean to you and why? Team is all about the unity and brotherhood. To have a good team you don't all have to like each other but you have to respect each other and know that all are working towards the same goal. When you run for a team it means more that to just run for yourself. In middle school, I played football, basketball and soccer. I sadly had to give up all three in high school to focus and running but I haven't had any regrets. I started running at age 6 because my mom was (still is) the Southlake summer track coach and she had me come out and run to try it and I loved it. 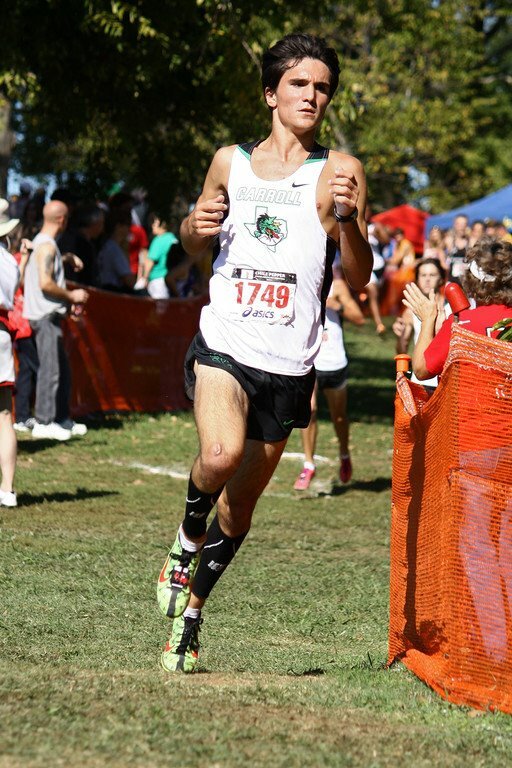 My highlights for cross country would have to be Winning state this year and going to Nike Nationals. Nike Nationals is just an amazing experience and fun time. My track highlight would have to be the Brooks Pr Invitational. That meet is a really fun weekend to be around such great people in a great environment. My favorite racing moment would have to be the state track meet last year when I earned a huge PR of 7 seconds. I went into the race without any expectations of anything. I was just there to race and it really relieved the pressure and I just ran my race and all went well for me. 11. Tell us a little about your coach Justin Leonard and how he has helped you develop during your years in high school. Coach Leonard has been both a coach and a mentor to me. He has helped me get through personal issues that I have had with running and worked with me to make me the best I can be on and off the track. He challenges me daily to test my limits while encouraging me along the way. I have been able to push myself because of his knowledge of the sport and his demand of excellence. He is not afraid to let me know when I am not meeting my potential in my running or in the classroom. He has a genuine concern for me and my best interest and I am no affraid to ask his advice in any aspect of my life. I will be forever indebted to him for allowing me to go for my dreams and aspirations. 12. Favorite distance in track? Favorite run? Favorite invitational? Favorite opponent(s)? Favorite track workouts? Favorite run? My favorite distance in is the 1600. Favorite meet is Texas Relays. There are so many fast runners there that provides a great atmosphere to run fast. My favorite opponent would have to be Troy Taylor. My first track meet ever I raced him in the mile and there was a .03 second difference between us and ever since we have had a great rivalry with sharing a pretty equal number of wins. My favorite track workouts and runs in general are speed workouts, where I do a 8x400 then and 8x200 at mile and 800 pace. Those workouts really challenge me mentally and physically. 13. Tell us a little about this amazing chemistry you have with your Southlake team, how was it developed, molded, who are the leaders...do you train year round together? Our team has grown tremendously this year. We took time to hangout with each other outside of running so we were not just running friends but have become true friends and it has really payed off. I think what has really set us apart from other teams is the leadership. Everybody is a leader on this team. There isn't just one or two guys who lead and the others follow. Everyone contributes and holds each other responsible. We train all year around together Mondays through Saturdays and occasionally meet up on Sundays. If not, we just do our runs on our own. What also really helps is that we are close in ability and that allows us to all train together. I am really looking forward to the state meet this year where I am hoping to take a shot at the state record. We as a team are also looking forward to going to New Balance Outdoor Nationals and run the 4xMile to try and take down the national record. I really don't have a favorite running movie or song but my favorite runners would definitely be Chris Solinsky and Russel Brown. Solinsky's 10k at Stanford was the coolest race I have ever seen. Russel Brown is my other favorite runner after his performance at the New Balance Indoor Grand Prix. Thank you very much for your time Trevor! This interview is about Trevor Gilley. I am not going to allow somebody to hijack a post to take up some personal problem. Duplicate his work then Walters! I didn't know featuring high school athletes was so wrong. You should be ashamed! This story is on a top high school athlete, so take your negativity grab a beer and chill out. You missed the comment that was removed. I saw it before it was removed and had to laugh at how insecure Albert seems to be about his blog. I draw the line at name calling. This site is used to share information and highlight athletes, coaches and teams. Any posts that takes away from that objective or are negative in nature will be deleted. If you don't like the site, I won't take it personally. The post did not take away from that. Aron Taylor hurts the sport more than he helps it, so it seems like by endorsing him you are going against your own rule. I would have to agree with the above post... Taylor's biases are ridiculous and he made an utter fool out of himself at NXN this past year (it was downright embarrassing). Taylor's xenophobic rant about Kenyans from a little while back I think takes the cake as far as embarrassing goes (though NXN was pretty bad too). Woah lets chill now keep negative comments to yourself. This blog takes some hard work and if you appreciate what Albert does (like I do) show a little respect. I think the interviews these past weeks have been great. I don't think it's so much a problem with Albert, but it's just the fact that he is endorsing XCNation/Aron Taylor who many would say is a self-promoting egoistical guy who is hurting the sport more than helping it. Yeah Buddy. I will say this, "Those who can not do, criticize." ^ Thanks Aron, sure appreciate your input! Thank you to my one fan! Ha! I just think that the people here are all avid supporters of your site and dont want to see you get lumped in with an individual/website that has, at best, controversial views on aspects of the sport. As a long time fan of your site my stance on your association with xcnation at this point is neutral . You have every right to expand your site and explore all options to do so. You brought us a homegrown product and made it what it is today, but I do have concerns with the association. As I tell my sons every time they approach me with questions that require some thought, I ask them " did you do your research " ? Once again, thanks for your hard work. Thank you SJS Fan. I am not changing what this site is all about. All I am doing is reaching out to runners and coaches in other parts of the state and beyond. I think we get so caught up in our own little area that we forget that there are a lot of really good runners/coaches with great stories that we can learn from as well. From my contacts with Aron Taylor, I have found him to be a passionate and tireless worker towards the betterment of spotlighting the sport of cross country. Ok I have to be honest here, I'm confused. I don't know Aron but am wondering why this blew up? What grudge do these anonymous posters have against xc nation website and the people who have run it? I went to the website and it really wasn't impressive and I have never been back. I have read the Letsrun thread, which lets be honest the anonymous posters there aren't any better, and could see how going on some rant about Nxn puts a bad taste in your mouth, but hasn't the race itself done that when they tried to recruit top finishers in the finish shoot of the california state meet to go to Nike instead of footlocker? Is it the protest you anonymous posters are against? That there is another website that wants to compete with dyestatcal? I would not be surprised if this was Rich Gonzales stirring things up. If its not do cal or Nike you are out of luck. But really, why so many haters? (that is if it's more than one and not different alias? Can you outline why this is bad? And lastly, we are talking about interviews. It's a Nor Cal site that does 95% of their interviews with nor cal but occasionally reaches out to So Cal. What's the harm in that? Nor Cal kids go south to compete down there in big races. I don't see that hurting our little sections up here but rather argue that it has helped make us better. So please outline your grievances or chill out. First, I am sorry that this interview had to turn into a launching pad to another subject. I started this website as a way to post NCS XC rankings. It's turned into something a little bigger than that but through it all, I have been very lucky to make some great contacts in the two sports and I have learned a lot along the way. I am really not interested in the politics involved with HS XC and TF. That's never been what my website is all about nor will it ever be.